The knives - attached to the hands of malevolent Palestinian Arabs with murder on their minds - continue to be out and active here in Jerusalem. 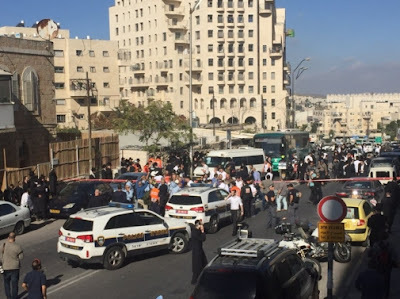 A woman of about 30 was stabbed a little after 10 this morning in the second Arab-on-Israeli stabbing of the day. The report from the ambulance people says "When we arrived at the scene we saw a woman about 30 years of age with a stab wound to her upper body in the front seat of a bus." The bus was reported else as the number 418 line. Egged's website says this line originates in Beit Shemesh. The assailant is being sought now via a manhunt in the buildings - and we assume the numerous construction sites - near and along the Shamgar Street in the Romema neighbourhood on the city's north side. The victim was rushed to Shaarei Zedek Medical Center for emergency treatment. The attacker approached the woman from behind as she waited at a bus stop on Shamgar Street, stabbed her in her upper back and fled. The woman was taken onto bus number 418, which stood open at the stop, where medics treated her wound. Medics said she is fully conscious and stable. The terrorist fled the scene, triggering a manhunt in nearby buildings and streets, according to police. Shortly after 11 a.m., police said they located the man, age 17 and half, hiding in a construction site nearby. He was identified as a Hebron resident, and police said he admitted he had carried out the attack. He also matched descriptions provided by eyewitnesses to the attack. The suspect was handed over to the special investigations unit of the Jerusalem Police for questioning. Two other suspected accomplices were also arrested by police nearby. How old are the accomplices? We don't know yet. The stabber, as with so many of these murder-minded young men and women, is not legally an adult. So let's chalk that up as yet another "victory" for the lethal education delivered by the PA and by UNRWA, the UN agency that's up to its eyeballs in the blood of Jewish victims and of Palestinian Arab wasted lives. And let's never lose sight of where the money - without which that catastrophic grooming of haters, savages and killers could never happen - comes from. UPDATE 9:00 pm Sunday November 29, 2015: The victim is Hisouri Tepalya, a Nepalese female national [Times of Israel], one of thousands engaging in caring for disabled and/or elderly Israelis. At least one of the PA's diplomatic missions in Europe thinks differently and, quoting the scurrilous WAFA news service which serves as the PA's authorized mouthpiece, calls her "an Israeli female settler [injured] in an alleged stabbing attack" [Website of the PA Mission to Denmark] because, well, everyone living in Israel is in their eyes a "settler" and just because there's a victim with serious knife wounds doesn't mean the Israelis ought to be believed.